Given the high cost of living in New York City, splitting rent with roommates can save tenants thousands of dollars annually. But as cash-strapped renters know, the hunt for a new roommate can be as challenging as the hunt for a new apartment. However, the “rooms for rent” feature on Naked Apartments is a tool that combines the apartment search and the roommate search at the same time. 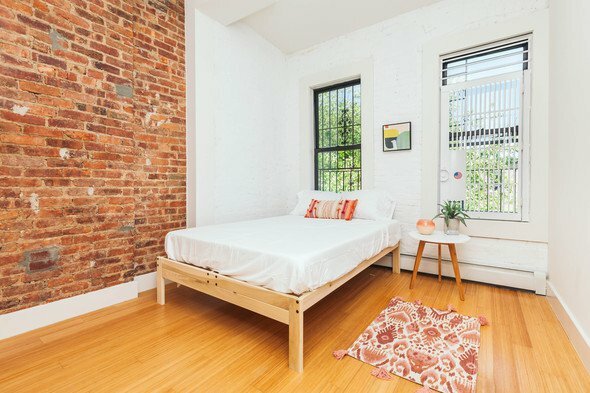 Unlike roommate apps that focus on people you’ll live with, the rooms for rent feature links brokers to landlords and tenants looking to fill rooms in shared apartments. Often you can get a more affordable living situation in a more expensive building or neighborhood by searching for rooms to rent. “It’s great for students and young professionals to live and work in this city. Why pay the whole rent when you don’t have to?” Says Melanie Boucos of EXR Realty, a broker who specializes in rooms to rent. Rooms to rent essentially functions like any other roommate situation with tenants sharing common space. Your room is your own private space and then areas like the kitchen, living room and bathroom are shared spaces which all roommates have equal access to. A large portion of the apartments listed on Naked Apartments’ rooms for rent pages have three or more bedrooms, which means you’ll be dealing with multiple roommates. Although having a handful of roommates is not everyone’s jam, it is a surefire way to land a lower rent. Typically, the more bedrooms an apartment has, the cheaper the rents get for each roommate. Some are located in some pretty sweet buildings with modern fixtures and appliances. 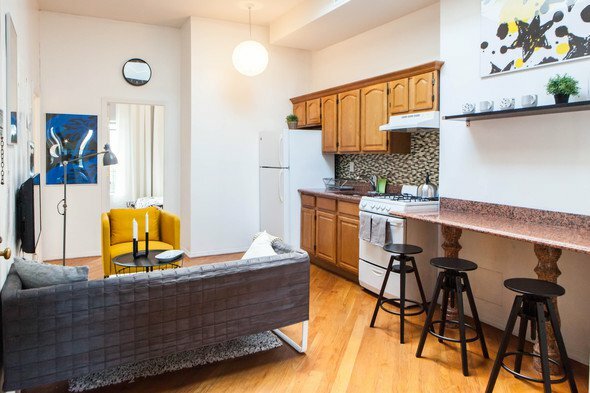 Moving into an already occupied apartment usually means the common spaces will come furnished like this room to rent in East Harlem. In this situation, the agent or landlord is looking for a tenant to fill a room in an existing apartment and sign a shared lease. For renters looking for an affordable, shared living set-up, this is a great option since the broker handles most of the logistics. The downside is you don’t have much wiggle room when it comes to choosing roommates since you are moving into an occupied unit. 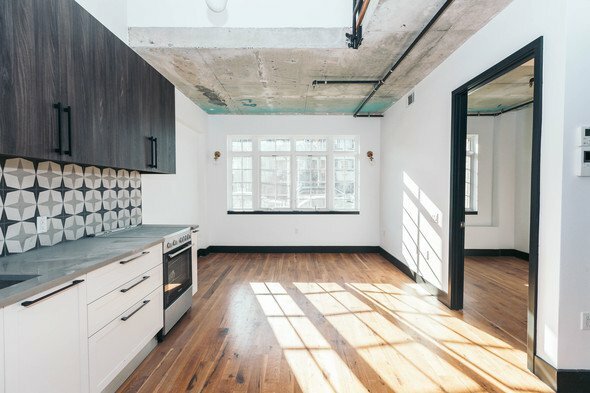 If, for example, you see an apartment and fall in love with it, but don’t jive with the existing roomies, then you’ll have to decide what matters more to you — the physical space of the apartment itself or the social dynamic within the apartment. You also may have less say in how the place is decorated since the current tenants have already put their stamp on it with their belongings and furniture. 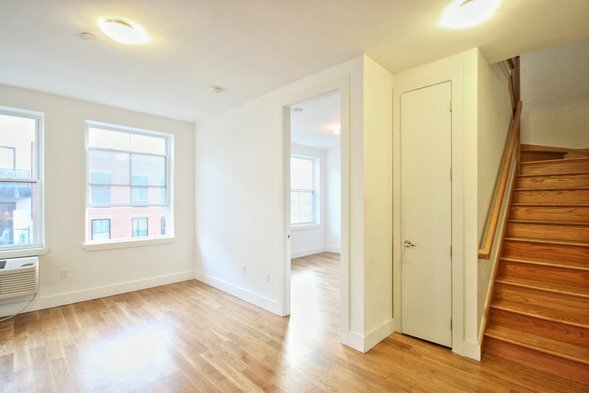 This is an appealing option for renters wanting to get dibs on an untouched space. You often can come in with roommates of your choice, or some agents will offer assistance with finding other roommates to fill the apartment. We’re not talking a sketchy Craigslist arrangement. In this situation, brokers act as a matchmaker of sorts. Boucos stresses the importance of making sure potential roommates are compatible. They analyze their interests, needs, schedules, whether they are pet-friendly and then have them meet each other prior to proceeding with any living arrangements. Both the existing tenant and the potential new tenant can reject the match, which helps ensure that roommates don’t get stuck in an unhappy or awkward living situation. “I’ve never had an issue with roommates and that’s due to how we match them,” says Boucos. “It’s super important that they are comfortable with each other.” Once a match has been made, all parties sign on to the shared lease. When going down the room to rent path, it’s important that you sign a shared lease — not an individual roommate lease. While it may seem appealing to have a separate lease for your room, there are serious risks involved. And while landlords might suggest this as a more flexible option for roommates, it most often is more advantageous from them than it is for you. Often, landlords can use individual roommate leases as a way to make more money than they would having everyone on the same lease as they can turn a higher profit on each room. In addition to inflating profits for your landlord, this set-up also is a violation of New York City’s Housing Maintenance laws, which prohibit landlords from renting out single rooms in a shared apartment. Landlord profits and housing law violations aside, individual roommate leases present a personal safety and comfort issue to you. These types of leases give landlords the freedom to move anyone into the other available rooms in the apartment without consulting you.